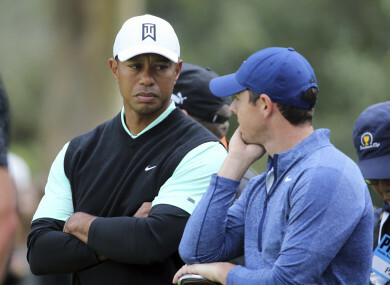 Tiger Woods and Rory McIlroy talk on the 10th green on Friday. RORY MCILROY IS currently five shots behind Justin Thomas at the Genesis Open, with the American eagling the first hole of the third round to open a one-shot lead over Adam Scott, where Tiger Woods was also surging as darkness halted play. Thomas and Australia’s Scott shared the 36-hole lead on 11-under par after both completed six-under par 65s in the rain-delayed second round. Thomas, who had 14 birdies in the 30 holes he played on Friday, kept the momentum going over six second-round holes on Saturday morning with a birdie at the fifth and a par at the par-three sixth — where he used a wedge on the green to chip over the distinctive bunker in the middle of the putting surface. Hours later he rolled in a 13-foot eagle putt at Riviera Country Club’s par-five first hole to move to 13-under par, separating himself from Scott who birdied the same hole before both parred the second. The third round was set to resume at 2.45pm as organizers pushed to complete a tournament that lost seven hours to a rain delay on Thursday. “It’s not going to be light yet,” said Woods, noting that players warming up for a 7 am start on Saturday could barely see. Tournament host Woods, who made the cut with one stroke to spare, wasn’t ready to be counted out. He was five-under through his first four holes to vault into a tie for 14th at six-under par. “Made a couple of putts,” said Woods, whose struggles this week on the greens included four three-putts in the first round. Email “McIlroy five shots behind Justin Thomas at Genesis Open as rain halts play in California”. Feedback on “McIlroy five shots behind Justin Thomas at Genesis Open as rain halts play in California”.